The Oswego County Historical Society will host the annual Christmas Open House on December 2. 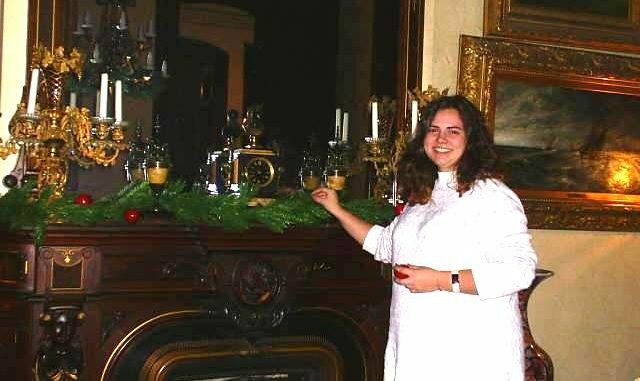 A special theme for this year is “The 1918 Christmas to Remember” that took place at the Richardson-Bates House, as recalled by a young Sally Bates. Pictured is museum assistant Senna Handley preparing the decorations for the holidays. OSWEGO – The Oswego County Historical Society cordially invites the public to celebrate the holiday season for the annual Christmas Open House at the Richardson-Bates House Museum at 135 E. Third St. in Oswego on December 2 from 1 to 5 p.m.
A special theme for this year is “The 1918 Christmas to Remember” that took place at the Richardson-Bates House as recalled by a young Sally Bates. Throughout this year has been a remembrance of the end of World War I on November 11, 1918, with the signing of the Armistice. Oswego had a strong involvement in World War I, including the many local men that enlisted, and also the training camp at the Oswego Normal School (now SUNY Oswego) and Fort Ontario U.S.A. General Hospital No. 5. The local fort hospital was the largest in New York State during World War I as a place for military care. One of the many enlisted men that served in the Army Medical Corps stationed at Fort Ontario during the war was a young man named Glenn Hunter. He served as a medic at the hospital. In 1918, Norman and Florence Bates were living in the Richardson-Bates House with their four children: Betty, Norman, Sally and Max. During the war, Norman and Florence were very involved in the cause and helped in many ways. Florence and her young children all helped with activities at the fort hospital. The Bates family also owned the Richardson Theatre, a lavish opera house built by Norman’s uncle Maxwell Richardson. The theatre sponsored events for the war, which included plays produced and performed by the soldiers that had theatrical backgrounds. They enjoyed enlivening the spirits of the wounded soldiers. They also helped boost morale of members of the community that were closely affected by the war, with fathers, husbands and sons fighting abroad. Solider Glenn Hunter was a special guest for Christmas Eve and Christmas Day dinners at the Bstes home, now the Richardson-Bates House Museum. Sally mentions him a few times as an honored guest in her small journal and how she danced with him on Christmas night at the fashionable Pontiac Hotel in Oswego. “Glenn Hunter was not familiar to me after reading the journal, and I wondered why a medic at the government hospital at the fort was a special guest. When I did a little search on him, it turned out that he was a bit of a celebrity before the war and after. He was a professional actor that starred on Broadway prior to the war and became a popular silent film star. His more famous films were featured after the war at the Richardson Theatre and he was often claimed as an Oswego boy, although he was only here during the war. However, he was still remembered from the plays he performed in Oswego during the war,” added White. Sally Bates would also one day fulfill her childhood dream as a popular and successful Broadway actress for more than a decade. She had been inspired and encouraged at a young age by the many famous performers she met at the family opera house and that were often invited to dinner at her family home. A live performance by popular Oswego musician Paul Vandish will take place from 2 – 4 p.m. He will perform traditional Christmas music and other popular songs for all ages. Many interesting items from the collection will be on display and the gift shop has various items perfect for last-minute Christmas presents. Refreshments will also be served throughout the afternoon. The Oswego County Historical Society is a non-profit organization dedicated to the preservation and promotion of the rich history of the county. The society maintains and operates the Richardson-Bates House Museum, a historic landmark listed on the National Register of Historic Places. The museum is open Thursday, Friday and Saturday from 1 – 5 p.m. and other days by appointment. For more information visit www.rbhousemuseum.org or call during regular hours at 315-343-1342.